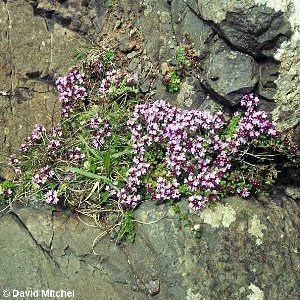 Wild thyme is a native species found growing on sand dunes or on the surfaces of rock outcrops. Its distribution in Northern Ireland is predominantly coastal (on dunes and along the basaltic scarp and in the Mourne Mountains) but with substantial populations in the Carboniferous limestone district of Co Fermanagh. An aromatic, low-growing and free-flowering perennial, rather woody, the leaves tiny, the flowers in rounded showy heads. All names: Thymus polytrichus A.Kerner ex Borbas; Thymus drucei Ronn. ; Thymus praecox auct. non Opiz; Thymus serpyllum auct. non L.; Thymus neglectus Ronn. ; Thymus britannicus Ronn. 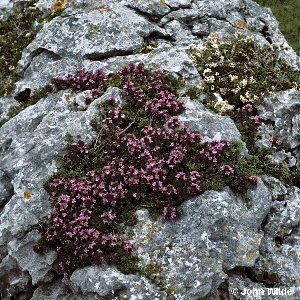 ; Thymus zetlandicus Ronn. & Druce; Thymus pseudolanuginosus Ronn. ; Thymus pycnotrichus auct. 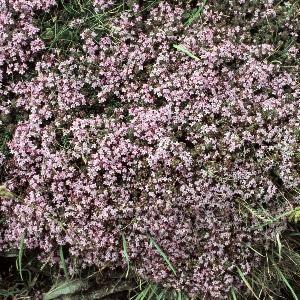 ; Thymus lanuginosus auct. ; Thymus carniolicus auct.